A new patio can look great in any yard. They are ideal for relaxing by your pool, entertaining guests, and unwinding in the great outdoors. 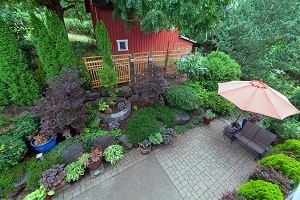 Though many homeowners would love to spend more time enjoying their property, they feel limited by the classic patio image that they have grown up with. However, when it comes to patio designs, the sky is the limit. They can be designed to meet any size, shape, material, or color preference that you can think of. To inspire your new patio project, look at 2018’s most popular designs below. If you want a more modern look in your yard, consider taking advantage of built-in features. You can create built-in bench seating, a patio bar, or planters, all in your yard. Offset the cold concrete seats with a bright pop of color in the cushions or pillows. Not only will this look ultra-contemporary but it will also offer a sophisticated, upscale appeal. Take entertaining to a new level with a complete outdoor kitchen on your patio. Equip your second kitchen with a stovetop or grill, mini fridge, sink, and a bar. Don’t forget to include a comfortable seating area where your friends and family members can enjoy their home-cooked meal. With a complete kitchen, your new patio will be the envy of all your neighbors and friends. Did anyone say s’mores? A fire pit can make any yard instantly feel cozier and warmer. Instead of choosing a standard circular fire pit, consider including unique fire features like an S-shaped fire pit. Plus, a fire feature can brighten up your patio considerably. Don’t be afraid to mix up the type of materials used in your patio design in Alpharetta. Consider using a combination of different woods, metals, tile, and concrete in your design. For example, if you are considering a natural look, you can build a patio made of cedar and decorate it with furnishings of mahogany or pine.